As much as I love cooking, sometimes I just need something quick to come home and make after work with as few dishes as possible. Cue this pasta. 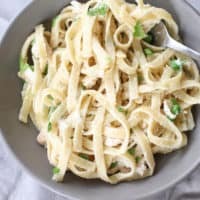 Chicken fettuccine alfredo is one of my comfort meals so being able to quickly throw it together from scratch rather than eating it from a frozen container is clutch. The best part about it? It’s super quick. I think the longest I had to wait was for the water to boil. I added mozzarella to it as well which made the sauce more cheesy and who doesn’t love cheese. If you’re looking for a more liquid sauce, retain some of the water that you cooked the pasta in. Add it into the pot a half cup at a time and mix through until you reach your desired consistency. I ended up adding 1 cup and found that it still stuck to the pasta and wasn’t too watery. ??? I just love it so much. You can totally make your own chicken for this dish, but I figured that picking up a rotisserie chicken would be easy enough. Just watch the flavor that the chicken is. Even when you take off the skin, it still retains some of that flavor. I ended up picking honey and thought it worked pretty well with it. 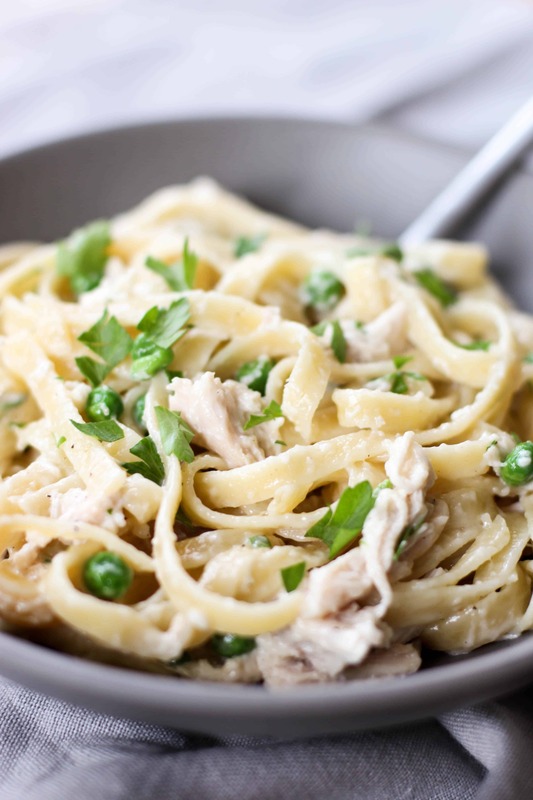 A quick one pot pasta dish perfect for weeknights. 1 rotisserie chicken, skin removed and shredded. I used just the breast meat for around 3 cups worth of chicken. Cook pasta according to the box in a large pot. Retain 1-2 cups of the pasta water before draining using a colander and leave pasta in the colander. 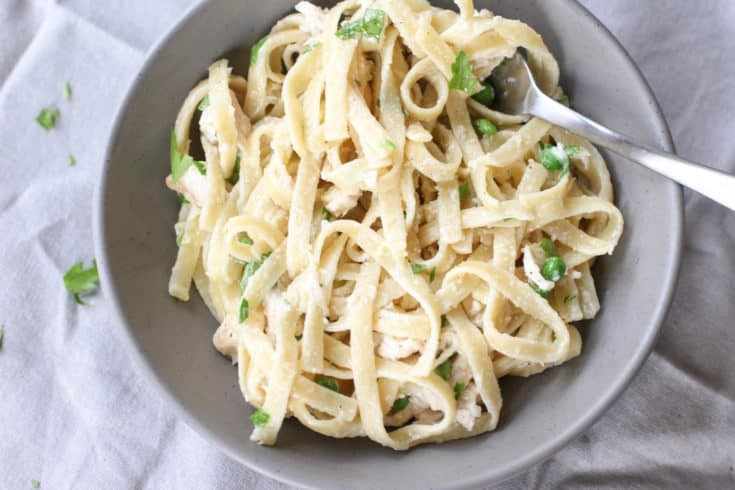 While the pasta is cooking, remove the skin from the chicken and peel into bite size pieces. Keep these to the side. Return pot to medium low heat and add butter to melt. Add in heavy cream, salt, pepper, parmesan cheese, and mozzarella until well combined. 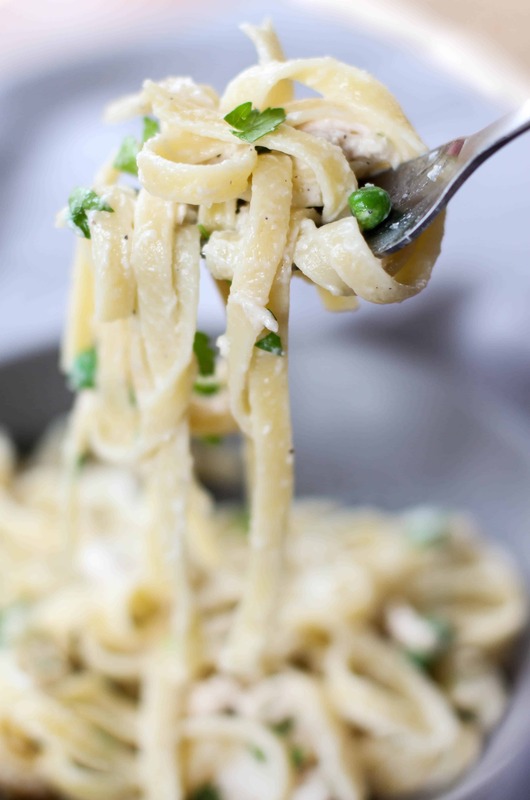 Add in cooked pasta, chicken, peas, and parsley to the sauce and mix until coated. If you are looking for more liquid sauce, add in pasta water until 1/2 cup at a time until you reach your desired consistency. I used about 1 cup for a sauce that stuck to the pasta.